In today’s world, it’s easy to get swept up in the routine of a busy schedule. Getting the kids off to school, coping with the traffic and waiting in endless lines. Sometimes, it’s even difficult to find the time to eat let alone spare a thought for Allah. But there are ways to find and make the time. There is a word that is attributed to the remembrance of Allah and that is Dhikr, Zikhr or Thikr; depending on what part of the world you are from there are a variation of spellings but they all mean the same thing. It’s a word that when translated into English essentially means the remembrance of Allah, either silently in the heart, or in the heart and by words. Many of us do remember Allah especially in times of despair to ask for help or in good times to be thankful, but what about all of the other times? What about the in between times when we are on the go? 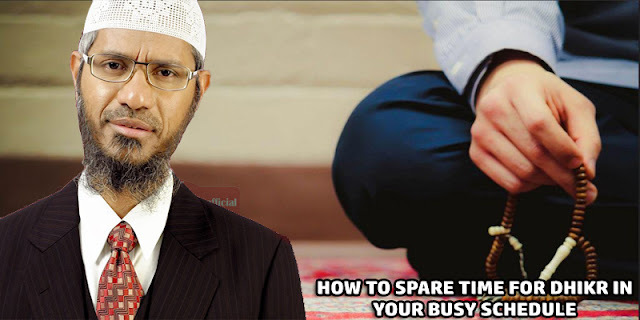 Fortunately, you don’t have to perform wudu (ritual ablution) to perform Dhikr, you just have to have some time. So, when you are waiting in traffic, standing in a queue, parked outside the school waiting for your child or even gardening, you can simply say the following short phrases. Positive remembrance of Allah brings about a sense of being thankful and appreciative of all He has done for us. By being aware of the glory of Allah in everything it can even prevent negativity or even depression. It helps to find the good in the bad, the positive in the negative, and the opportunities in the problems. Even more than that, it will purify your heart just by simply remembering Allah so He remembers you in this life and the next. Do take the opportunity to lift your spiritual status and increase your Iman by the remembrance of Allah. Do increase your chances of entering Paradise (Jannah) through Dhikr. Do say, La ilaha illa Allah (all praise is due to Allah) as many times as you want as the rewards are great. Be mindful of Allah no matter where you are except for the toilet or bathroom. You can engage in Dhikr either in silence or through the spoken word. Be in the presence of angels who come when one engages in Dhikr only to carry the good news up high. Together, there are times when you can take advantage of making dhikr as part of a larger group such as praying in congregation, during Ramadan, attending al Jumu’ah and even during the pilgrimage of Hajj. These specific times allow us to engage in dhikr while in congregation, reciting sura’s, making dua or reading the Qur’an not in unison but as an individual for our own self enhancement. Take the opportunity to encourage your children to engage in dhikr. Just include them, teach them and share dhikr together. So, find the time in your busy schedule and spare some thought to the remembrance of Allah. Bear in mind the best time is given as being between al-Fajr and sunrise, between al-Asr and the sunset, after prayers and before you go to bed. And, if your memory needs a jog there are even apps for your phone that you can download for free to remind you to remember Him.